Noooooooooooooooooooooooooooooooooooooooooooooooooooooooooooooo! It looks like my trade idea was way-off as price continued to shoot up after the appearance of the shooting star. I will not get emotional, I will not get emotional!!! Okay, now my head is clear. Fundamentally speaking, I think Japan’s recently-released trade balance figures are supportive of my trade idea. It has been claiming that the yen’s rise is harming its export industry. But the latest data suggests it’s doing just fine, showing a 15.9% year-on-year growth in exports back in September. Oh, I almost forgot! China also came out with positive trade balance figures just a few hours ago, too. According to October’s results, exports climbed 22.9% and imports jumped 25.3% year-on-year. I think Japan stands to benefit from this as well since China is one of its largest trading partners. As for technicals, I’m banking on some good ol’ candlestick analysis. Actually, this is more of Big Pippin’s analysis than mine, as I saw this setup on his chart art earlier today. As you can see, a shooting star candlestick reversal pattern has appeared on the 4-hour chart. Stochastic isn’t in overbought territory yet, but with resistance at the 82.00 handle holding and the formation of that shooting star, this seems to be a good technical setup. 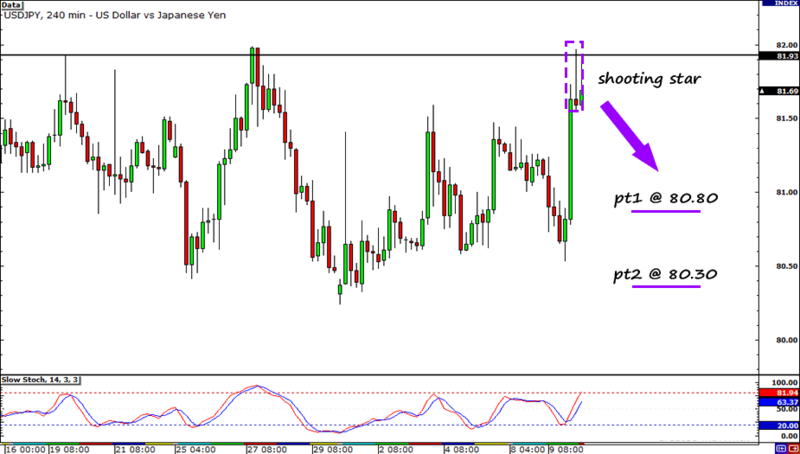 I will have two profit targets on this trade, just in case the pair moves strongly downwards. I set the first one in the middle of the range at 80.80 and set the second one near the previous day’s low at 80.30. My stop is roughly equal to the pair’s average true range of 80 pips. Short USD/JPY 81.65, pt1 at 80.80, pt2 80.30, sl at 82.40. I will risk 1.0% of my account. 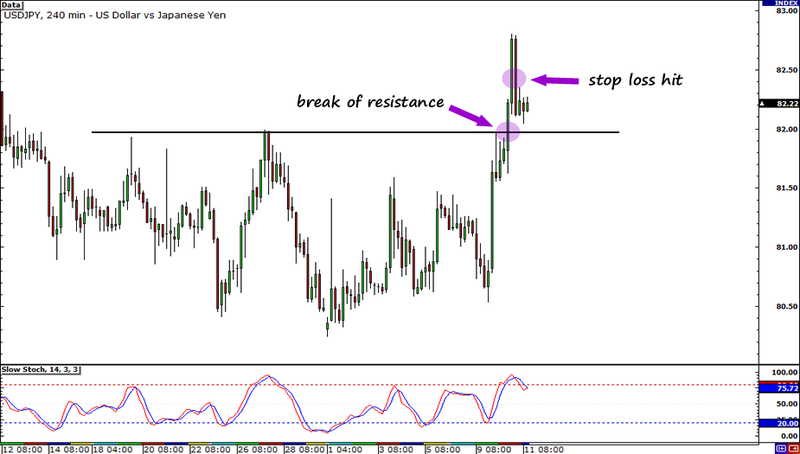 You can also read about my trade ideas at MeetPips.com.